Or, why should I spend an hour of my time contributing to this study? We are a group of researchers who think art and artists make a difference in peoples’ lives. The recent global economic downturn has impacted many people in different parts of the world. Artists have been hit especially hard, not only through government budget cuts, but also through decline of personal revenues. This may or may not be true in your case. That’s why we would like to hear your story. In this survey, you will see a significant number of open-ended questions that allow you to express your experience in your own words rather than forcing you to simply select options from a pre-defined list. There are a number of close-ended questions as well that should speed up the process of completing this survey. We know you are busy, but your experience is important. By downloading this survey, you can work on it at your own pace, saving it to your hard-drive to complete at any time. As a way of saying thank-you, we will enter all participants into a draw to win 10 chances at $50. As well, we will make available to you a report highlighting the survey findings, upon request. Click here to go to the SFU Centre for Policy Studies on Culture and Communities webpage for full information. Right-click and choose Save As… to download the Interactive PDF survey to your hard-drive. 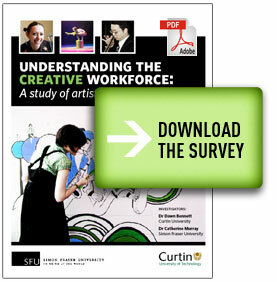 Send your completed survey as an email attachment to cmnsart@sfu.ca. Deadline is July 31, 2010.